OUTGOING Mayor Martin Miley was honoured and privileged to hold the title for the past year. The honour of wearing the chain brings a busy schedule as Cllr Miley can attest to. Over the year he attended 333 events and lost two-and-a-half stone along the way. “I learnt a lot and I grew a lot mentally. I had a fantastic time and I enjoyed it thoroughly. It was busy but it was good being busy,” said Cllr Miley. He had many high points during the year, including a trip to New York on St Patrick’s Day to meet with the Kildare Association. “There I met a man called Mike Flood who left Kildare in 1964. The population of Kildare at the time was 64,000 and today there are more than 222,000 people. That shows how much Kildare has grown and prospered,” said Cllr Miley. The signing of contracts for the widening of the N7, the Kerdiffstown redevelopment and the opening of Athy library were other high points during the year. 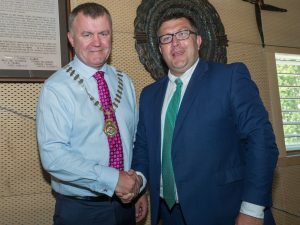 “I suppose the pinnacle was the opening of the library in Athy and I was very proud to chair our last meeting there,” said Cllr Miley. He said Kildare Co Council is so much more that a system for collecting fines and taxes. He called on people to avail of the many services on offer from the library and arts to sport and community partnerships. He also worked a lot during the year with K Sports also helping to get the non active out and about more. He laughs as he adds that he himself lost two-and-a half-stone as mayor of the county. “I still have another bit to go but I didn’t concentrate on it at all, it was just such a busy and active journey for me,” he said. The smaller events he attended made just as much an impact on Cllr Miley. He remembers fondly attending an ICA event in Kill. He thought he was in for a relaxed evening until he was faced with 40 elderly ladies who challenged him on everything possible. “They were so engaging and their understanding of politics and services was just brilliant. They have their fingers on the pulse,” he said. A visit to the Kildare Youth Services in Athy led to a similar experience for Cllr Miley. At this meeting he enjoyed a discussion with 15 young people about life, his position as mayor and ideas for the future. Cllr Miley said the county still has many challenges particularly housing and homelessness. He said he would like to see a real focus in Kildare on getting people on to the property ladder. “There are families on a €40,000, €60,000 and even €80,000 income and they can’t purchase a house in their own county. Overall he said he had a fantastic time as mayor and enjoyed the role. He thanked everyone for their support, his family, the citizens of Kildare and his fellow councillors.